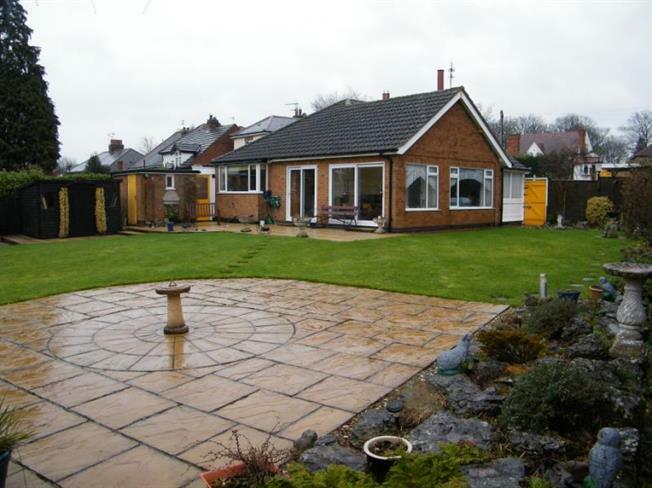 3 Bedroom Detached Bungalow For Sale in Leicester for Offers in excess of £325,000. Spencers of Oadby are proud to present for sale this beautiful detached family bungalow. The property is located well within highly regarded local school catchment areas and has an excellent sized loft space that could easily be converted into a further bedroom (subject to relevant planning consents). In brief the property comprises lounge, dining room, sun room, breakfast kitchen, utility room, W.C, family bathroom and three bedrooms (two double). Outside there are stunning gardens to the front and rear, off road parking for numerous vehicles leading to a detached double garage. To the front of the property is a tarmac and brick driveway with space for numerous vehicles, mature trees and shrubs surrounding and access to the rear via a side gate. To the rear is a very well maintained garden mainly laid to lawn with patio areas and mature trees and shrubs throughout. There are 2 wood sheds, a green house and a brick store with single sink and drainer.